Hello, and welcome to the third thrilling installment of the American Beard Report. Coming up in November many new beards and moustaches will begin their initial journey into awesomeness with the annual Mo’vember event, which happens on a global scale. Many now-seasoned competitors got their start growing a “mo” (moustache) for mens health awareness. One of the main goals of Mo’vember is having an everlasting impact on the face of Men’s health. “We’re the charity tackling prostate cancer, testicular cancer, mental health and suicide prevention.” To learn more about Mo’vember events in your area please visit their website. October was a busy month for American facial hair, kicking it off with the Great American Beard and Moustache Championship in Richmond VA. More than 340 competitors (including a reported 150 Bearded Villains members) joined forces for this NACBMA biennial event, raising $25,220 for The Humane Society of the United States & the Pink Ink Fund. ESPN was onsite filming the competition and following some of the Mean Beard Team, so be on the look out for some bearding footage on the popular sports network. Beardfest in Grants Pass, OR proved to be a really fun event. Proceeds from Beardfest went to support the R.O.C. food Pantry Grants Pass. The ROC is the largest of 9 pantries in Josephine County. The population that is served is largely Senior’s and Single parent families with 1/3 of them being children! Serving over 4000 people monthly! The volunteers at ROC donate on average 1000 incredible hours a month. The 7th Annual Epic Bead Competition in Spokane, WA drew in many well-known beard competitors and judges alike. Congrats to their Grand Champion, Kris Schwiebert, who won 1st place in Mustache and was then awarded Best in Show, all while wearing what appears to be a pineapple outfit. You can see their podium results on their Facebook page. Bearding Man in Shippensburg, PA had some delicious vegan Chili-Cheese Dogs from Unbuntu Foods, which is one of the more challenging foods for most facial hair enthusiasts. At Beards at the Beach in Ocean City, MD the Maryland/Delaware Beard Coalition raised $5,090.76 through their raffle and competition; Here is the breakdown: $2,000 to Pink Strides Ocean City, $2,000 to Special Olympics Maryland, $1,090.76 to local veterans under the guidance of Hogs for Heroes, OC. Great work! At Big Whisker Revival 5 in Cincinnati, OH the Cincinnati Beard Barons event was able to raise $4,300.00 for each of their chosen charities, The Barracks Project and Stepping Stones, with a grand total of $8,600.00 raised. They also raised $232.00 for the Sandlin Education Trust. Wow! Best in Show winner was Marc Bennett, a Cincinnati Beard Barons member. The 6th Annual Beardtoberfest hosted by Beard team Kansas was a huge success with a great silent auction. We’ve heard that it was a well planned and organized event, with proceeds going to the Humane Society of Flint Hills. A list of winners will be posted soon on their Facebook Page. This edition of the American Beard Report will be submitted prior to the upcoming weekend, but here is what we will be missing. 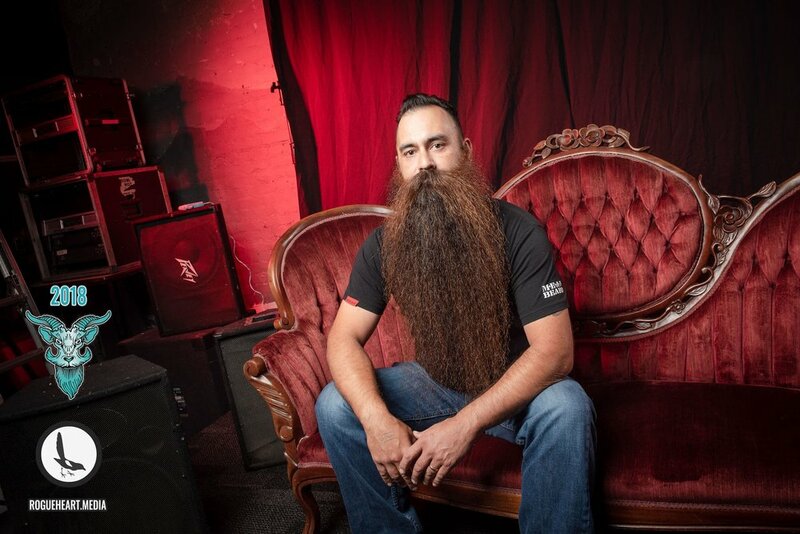 There are several AMAZING competitions happening on October 27 around the country including the 6th Annual Boulder Beard and Moustache Competition, hosted by the Boulder Facial Hair Club in Longmont, CO. The Arch Classic Beard and Moustache Competition in St. Louis, MO hosted by BAMSTL. This event will also include a Costume Competition. The Tri-County Beard and Mustache Society can be seen promoting some of their upcoming events on their local news station, including the 4th annual Beard's for Band; Mustaches for Music Competition in Lapel, IN. You can see the TV spot here. Last but definitely not least, on Oct 27 the 5th Annual Mad Viking Monsters Ball Beard and Moustache Competition will be taking place in Conneaut Lake, PA. “These guys throw one of the best competitions around. They rent out a whole f***ing hotel and everything” says Veteran beardsman “Fkn Guido” of Mountain Man Oils and satellite member of the Austin Facial Hair Club. This will be an epic Beard Competition and Costume Competition to benefit the Children’s Miracle Network Hospital of Pittsburgh PA - Children’s of UPMC Pittsburgh. Judges will include Jeff Langum, Rocky Lammarino and Carla Grigg, among other well-known beards-persons. That’s it for now. Below check out the Canyon State Beard Club spot and our American Beards-persons for November. Thanks for reading, and keep Growing for America! When were you established? We were established in June 2012 when we had our first club meeting. How many members do you have? Right now we have between 15 to 20 members. What inspired you to form a club? We started the club out of the need of wanting to join a club. Just like most people, we saw the show Whisker Wars and just assumed Arizona already had a club to join. We figured out pretty fast that AZ had no such thing, so we made our own club. Do you hold an annual competition? We started our annual competition in Nov 2013. We were asked to help promote a show for the band The Beards. But during the government shut down they were denied their visas and they wanted to cancel the show. We convinced them that our beard competition would be just as fun and they kept the show going. It's at that years competition we met some of our closest and dearest friends in this community. Ever since then we have been doing our annual competition "Whisker Bent & Hell Bound" the first or second weekend of November. Do you have a charity/charities to benefit? We have helped so many different charities from pet rescues too homeless hydration projects. As of now we have been doing our annual competition for The Singletons the last 3 years. They are an amazing local nonprofit that helps single parents who are battling cancer with their everyday needs. We have donated our time, money and even deep freezers to this organization. Please check out the wonderful ways they are benefiting our community. Please list your proudest moment as a club: The clubs proudest moment was the first time we donated and toured the Singleton's facilities. We saw how they help others, and saw how our club helped them in achieving their goals. Also in the last few months we are really proud to have joined the North American Competitive Beard and Moustache Alliance. Something the club has always wanted to be part of and we are happy to put our clubs input on Alliance issues and solutions. Photo by: Rogue Heart Media Inc.
Club/Product Affiliation: No club , I’m affiliated with Mean Beard and Mean Beard Products; I am a Mean Beard Sponsored Ambassador. Why do you do it and/or Best thing about it? I watched whisker wars and knew I could grow a decent beard and wanted to have one like those guys. Bryan, Myke, and Aarne. Started growing and haven't looked back. I love the competitive side of bearding. It's all about helping charities ,and meeting great people. Win, win situation. I hope to be a World Champion someday. We'll see how it goes. Why do you do it and/or Best thing about it? I think my favorite part of bearding is the community! I've met a lot of wonderful people and gotten to help raise money for countless charities. My club donates money and canned food to the Los Angeles food bank every year and it makes me feel good that we can come together and make a difference in the community. Hometown: Child of the world, but in Austin for the last 17 years. How long have you been bearding? I've been affiliated with AFHC for a little over a year now, but officially competing since February 2018. Why do you do it and/or Best thing about it? I do it because of the pageantry and creativity. For me the message is about celebrating who you are inside and out. The charity aspect is also a big draw. Giving back while having a good time has always been my cup of tea. Have you won any awards? In 2015 I got 2nd place whaler at US Nationals in NYC. Other than that, I have almost never even placed. Why do you do it and/or Best thing about it? The community and the friendships I have gained from bearding are invaluable! There is nothing quite like traveling around the country with a group of your best friends and getting to do so many fun things. Even if my beard fell off tomorrow, I'd continue to hang out and travel with these folks.